Concerns over the use of security firm Thompson and Clark by Government departments has escalated into an SIS investigation after claims of serious misconduct at the at the Ministry for Primary Industries. Emails from an unnamed SIS staff member to either Gavin Clark or Nick Thompson “raise questions in relation to [unprofessional] conduct and possible bias in favour of Thompson and Clark,” SIS director general Rebecca Kitteridge said in response to an Official Information Act request. “In light of this correspondence, I have asked for several matters to be looked into… These questions are the subject of an internal investigation,” Ms Kitteridge said. The emails appear to show the SIS staff member helping Thompson and Clark book contracts with government agencies around their Protective Security Requirements – “the policy, protocols and guidelines that help agencies identify what they must do to protect their people, information and assets”. The emails also show Thompson and Clark secured its contract to develop the Department of Conservation’s Protective Security Requirements after checking in with the SIS staffer. “The cosiness of the relationship between Thompson and Clark and some parts of the public service is concerning and that is one of the things that the investigation is going to get to the bottom of,” Mr Hipkins said. It looks like a thorough investigation may be warranted here. The Electoral Commission is investigating pro-NZ First advertising during the election that was not declared by the party in their returns. The Electoral Commission is looking into an ad placed by the horse racing stalwart Sir Patrick Hogan during last year’s election campaign. The ad, in the racing industry publication The Informant last September, urged people to party vote New Zealand First because of its leader Winston Peters’ support for the racing industry. The Electoral Act requires people who take out ads promoting a political party during an election campaign to have the party’s permission. And NZ First did not declare this advertising in their electoral return. The Commission has not had a great record trying to enforce electoral law so I wouldn’t expect much from this. But Hogan and the racing industry got what they may have expected from Peters – a special tax break for horse breeders. Last week’s budget allocate $5 million on tax deductions “for the costs of high quality horses acquired with the intention to breed” if it is a stand out yearling “that commands attention by virtue of its bloodlines, looks and racing potential”. It wasn’t made clear whether the Minister for Racing would personally judge the quality and looks of yearlings. See Peters and a handsome horse called Neoliberalism. 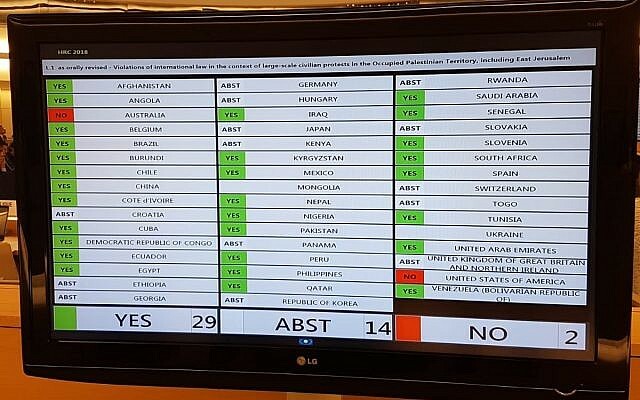 The UN Human Rights Council has voted strongly in favour of an investigation into Israel’s killing of Palestinians during protests on the Gaza border this week. New Zealand must not be on the Human Rights Council. It’s not irrelevant if there is good cause to investigate indiscriminate violence and killing – this applies to both the Palestinians and the Israelis. The investigation should look at whether either or both sides acted illegally. If Human Rights may have been breached then it is appropriate to investigate. Next March is a long to wait for a result. A lot is likely to have happened in Gaza and Israel by then. The Todd Barclay saga, in which the Police decided not to prosecute Barclay for making audio recordings of an employee in his electorate office in Gore (the Police are currently reviewing that decision) has raised the issue of what can and can’t be legally recorded. Surveillance video is common in public and in work places. The Privacy Commission website states that it is “usually unfair to record someone without telling them”. Can I record someone without telling them? Whether making an audio or visual recording of someone without telling them will breach the Privacy Act will depend on the circumstances in each case. In particular, it will depend on who is making the recording and why they are making it. If you are an individual and you are making a recording in relation to you own personal, domestic or household affairs (for instance you’re recording a personal conversation with a friend), there is an exception which says that, generally, the Privacy Act won’t apply to what you do. However, if you collect, use or disclose personal information in a way which would be highly offensive to a reasonable person, this exception will not apply. In other words, someone could make a complaint about you. If you are making the recording for any reason, other than your own domestic, personal or household affairs, the general rules about collection of personal information will apply. In particular, it’s usually unfair to record someone without telling them. You should also keep in mind that there may be other laws which apply apart from the Privacy Act – for instance, recording a private conversation that you’re not involved in will often be a crime. That seems to be what Barclay was investigated for. Can an agency make a video or audio recording of me without telling me? Generally speaking, an agency must tell you if it is collecting your personal information. However, there are some cases where an agency could collect your information without telling you. For instance, it might not have to tell you it was collecting your information if this would undermine the agency’s purpose for collecting the information in the first place, or if it would endanger the safety of any individual. If you believe an agency has collected your information without telling you, we suggest that you contact the agency and ask to speak to their privacy officer to see if you can resolve any concerns you have about this directly. If you’re not able to resolve your concerns, and you believe you have suffered some sort of harm as a result of the collection of your information, you can make a complaint to us. Or make a complaint to the Police, as Glenys Dickson did in the Barclay case. …it’s not an offence to record yourself in conversation with others, even if they don’t know you are doing so. Nor is it an offence to record other people without their knowledge if they are not engaged in a “private communication”. But the allegation against Barclay is that he left a dictaphone running when he wasn’t in his office so as to record what Dickson was saying in conversations with constituents. Geddis said the alleged breach in law on which Barclay was investigated needed to tick three boxes to be proved. The first was there needed to be a recording with an “interception device”, as the law phrased. In this case, he said, the “device” was alleged to be a dictaphone. Then it needed to be proved it was a private conversation – in this case, said to be the electorate office where Dickson worked. The third element was proving that the recording was made intentionally, he said. Conviction to the two-year point is the trigger which forces MPs to resign from Parliament. Although a battalion of journalists were about a metre away behind a window, let’s assume that Key and Banks couldn’t reasonably expect it to be overheard, and that the circumstances indicate that both desired their conversation to remain private. In an electorate office if the conversation was in an open office where others were present and could hear it then it may not be private. But if Dickson was the only person present then it could be private. The only issue, then, is whether the interception was intentional. On the paper’s account, it was inadvertent. In fact, it says, the cameraman tried to retrieve his recorder before the conversation but was stopped by Key’s security folk, and didn’t know that the recording was even happening. Now, I don’t know anything more than has been reported. But I wonder whether there is room for doubt about whether the cameraman genuinely didn’t know that the conversation was being recorded. If it could be established that he did know, then he has committed an offence. Bill English has said (in the now public police statement) “I had a conversation with him regarding Glenys Dickson leaving his office and he said to me that he had recordings of her criticising him”. “Recordings” is plural. It could be difficult claiming that more than one recording was accidental. We will find out next week what the Police decide to do and whether they re-open the case or not.